NEC, the Japanese company has announced their latest rugged laptop PC called as the ShieldPRO N22G. According to them this model is waterproof, dustproof and can even withstand the vibration and impact after being dropped from a height of 90cm. 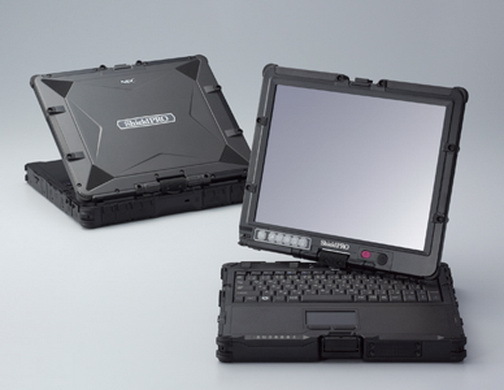 The NEC ShieldPRO N22G is provided with a 12.1inch backlit LCD touchscreen display which is capable of providing a resolution of 1024 x 768pixels. This model is powered by a 1.33GHz Intel Core i7-660UE dual-core processor and is also equipped with Intel QM57 chipset. It has a 4GB RAM and a 100GB or 160GB HDD for storage. Even an optional 32GB SSD and integrated Intel HD Graphics can be added to this model. Some of the other specifications provided with this model include an SD slot, PCMCIA, three USB ports, FireWire, 802.11a/b/g/n Wi-Fi, and Bluetooth 2.1+EDR. The Battery provided with this model is expected to give a backup up to 12 hours. The Shield PRO N22G’s dimensions measure about 11.4 x 10.04 x 1.85inches and weighs around 2.7kg (5.95 pounds). Though this model looks a bit bulky but it truly gives a rugged feel at its 1st impression and even the Shock resistant feature makes it complete.